Get-Lottery.com - Italy - SuperStar with current jackpot: € 144 Million and next draw: 27/04/2019. Reviews and details you need to know. Play Italy SuperStar lottery online with your selection of six main numbers from a guess range of 1-90 and an additional number called the SuperStar, also from a guess range of 1- 90. You can only select the SuperStar number once – the same number will be used on all the lines of your purchase. The SuperStar number truly lives up to its name by adding eight prize divisions to SuperEnalotto’s original six. First prize is a €2 million top-up to a regular match-6 SuperEnalotto jackpot with the SuperStar, and third prize is a €1 million boost to SuperEnalotto’s 5+Jolly second place prize. Matching the SuperStar on a winning SuperEnalotto ticket can also grow other SuperEnalotto secondary prizes by between 25-100 times, and the SuperStar has its own unique prizes for 2+PB, 1+PB and 0+PB, giving a total of 14 prize divisions! SuperEnalotto SuperStar offers fourteen fantastic prize divisions, including a SuperStar jackpot that has ranged from €1.3 million to close to €180 million – without a jackpot cap, there really is no limit! To win the top prize in Italy’s top lotto, match all six main SuperEnalotto numbers and the SuperStar number, which is drawn from a second drum of balls marked 1-90. The six main SuperEnalotto winning numbers are drawn from a single drum containing 90 balls, and a seventh bonus number called the Jolly Number is drawn from the same drum. If you win at the SuperEnalotto and have played the SuperStar version, you will want to pay attention to the eighth number, called the SuperStar, drawn separately from a second drum. It could make your win and celebrations even richer! 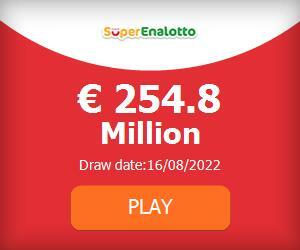 The SuperEnalotto jackpot was last won in the drawing held on 1 August 2017. One lucky player won a $2 million SuperStar prize in addition to claiming the huge SuperEnalotto jackpot on 27 October 2016. His/her total prize money – an incredible €165,538,706! You can only win the SuperStar if you play the game, so get your lottery tickets today!